"New York is the finest city in the world." So boasted a young man travelling to England in 1850. The young man made this assertion to Andrew Jackson Downing, a fellow New Yorker. Downing was a landscape gardener – he arranged plants and man-made structures around people's houses. He was therefore eager to visit London's public parks. New York City had some open squares, such as City Hall Park, but no large parks. In one of London's parks, Downing chanced upon the patriotic New Yorker. When the young man saw Downing, he threw up his arms and exclaimed, "Good heavens! what a scene, and I took some Londoners to the steps of the City Hall last summer, to show them the park of New York!" Downing told this story in a magazine article, adding, "The question may well be asked, Is New York really not rich enough, or is there really not land enough in America, to give our citizens public parks of more than ten acres?" Other New Yorkers were asking the same question. In 1851, Mayor Ambrose Kingsland proposed that the city create a public park. After much discussion, the city bought land in the suburbs. 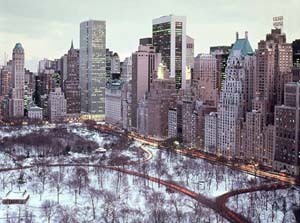 A contest was held for the design of the new park, which was to be called Central Park because it was in the center of Manhattan Island. The creators of the winning design, Calvert Vaux and Frederick Law Olmsted, were an odd combination. 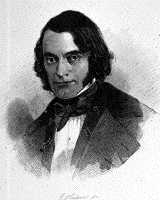 Vaux was an English-born architect who had been Downing's partner before Downing died in 1852. Olmsted was a moderately successful author who had been a highly unsuccessful sales clerk, sailor, farmer, and publisher. He was now superintendent of Central Park's work force. But Olmsted and Vaux shared a love of nature. Vaux celebrated the fact that Americans loved nature more than artificial objects; he felt that this showed inherent good taste. Olmsted believed that everyone, even the city's poor, should have contact with nature. He hoped the new park would "supply to the hundreds of thousands of tired workers, who have no opportunity to spend their summers in the country, a specimen of God's handiwork that shall be to them, inexpensively, what a month or two in the White Mountains or the Adirondacks is, at great cost, to those in easier circumstances." Vaux and Olmsted therefore decided to emphasize nature over man-made objects in their park design. They crafted the park to look as though it were untouched nature. They arranged to have trees planted on the park's borders to hide the city's buildings. Man-made structures in the park, such as buildings and water reservoirs, were made as inconspicuous as possible. The two men designed paths that weaved through the scenery like country trails. Their cleverest idea involved the roads that allowed city traffic to cut through the park. Olmsted and Vaux were upset at the idea of giving park access to the traffic of that time: "coal carts and butchers' carts, dust carts and dung carts." They believed that this would destroy the natural serenity of the park. Instead, they proposed digging tunnels under the park to hide the roads from view. Not everyone liked the winning design. One park board member, Robert Dillon, thought it was ridiculous to make the park look completely different from the city. Instead of winding paths, he said, the park should have a straight avenue that gave views of all natural and man-made park structures. Dillon especially wanted park visitors to see the artificial water reservoirs, which he called "the jewels of the park." Olmsted, who was in charge of design revisions, was appalled. Soon, he believed, the city would grow to surround Central Park. At that time, "the picturesquely-varied, rocky formations of [Manhattan] Island will have been converted into foundations for rows of monotonous straight streets, and piles of erect, angular buildings." Then, Olmsted said, the natural contours of his proposed park would be of priceless value. The park board rejected most of Dillon's proposals. However, it instructed Olmsted to separate the pedestrian, horse-riding, and carriage paths from each other. Vaux and Olmsted had thought that walkers would like to watch the carriages, but Dillon had protested that pedestrians ought to be "free from the distraction, the noise, the dust and the danger of horsemen and carriages." Olmsted realized that, by adding bridges, he could make the different paths wind over and under each other. The paths would therefore work like the road tunnels. By separating the different types of traffic – pedestrians, riders, carriages, and business travellers – Olmsted could make Central Park even more of a peaceful haven from city life. Several years later, Vaux wrote a friend that Central Park was meant to give city-dwellers an "instantaneous and complete" change from city to country. Vaux and Olmsted succeeded in their plan to make Central Park a piece of country within the city. Just like the rich, the city poor were now be able to visit nature. Barlow, Elizabeth. Frederick Law Olmsted's New York. New York: Praeger Publishers, 1972. Chadwick, George F. The Park and the Town: Public Landscape in the 19th and 20th Centuries. London: Architectural Press, 1966. Conway, Hazel. People's Parks: The Design and Development of Victorian Parks in Britain. Cambridge: Cambridge University Press, 1991. Cook, Clarence Chatham. A Description of the New York Central Park. New York: F. J. Huntington, 1869. Dillon, Robert J., and August Belmont. "The Central Park: Objections of Two of the Commissioners to the Plan Adopted." New York Times 7 June 1858, 5. Downing, A. J. Rural Essays. Ed. George William Curtis. New York: Putnam, 1853. —. A Treatise on the Theory and Practice of Landscape Gardening Adapted to North America. 5th edition. New York: C. M. Saxton, 1856. Fabos, Julius Gy, Gordon T. Milde, and V. Michael Weinmayr. Frederick Law Olmsted, Sr.: Founder of Landscape Architecture in America. No place of publication: University of Massachusetts Press, 1968. Fein, Albert. Frederick Law Olmsted and the American Environmental Tradition. New York: George Braziller, 1972. Graff, M. M. Central Park/Prospect Park: A New Perspective. New York: Greensward Foundation, 1985. Kalfus, Melvin. Frederick Law Olmsted: The Passion of a Public Artist. New York: New York University Press, 1990. Kinkead, Eugene. 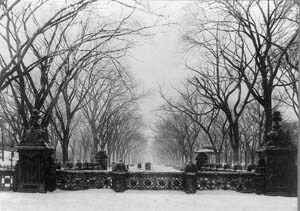 Central Park, 1857-1995: The Birth, Decline, and Renewal of a National Treasure. New York: W. W. Norton, 1990. Olmsted, Frederick Law. Frederick Law Olmsted, Landscape Architect, 1822-1903. Edited by Frederick Law Olmsted, Jr., and Theodora Kimball. 2nd edition. New York: Benjamin Blom, 1970. —. Landscape into Cityscape: Frederick Law Olmsted's Plans for a Greater New York City. Edited by Albert Fein. Ithaca: Cornell University Press, 1967. —. The Papers of Frederick Law Olmsted. Edited by Charles Capin McLaughlin and Charles E. Beveridge. Baltimore: Johns Hopkins University Press, 1977-. Reed, Henry Hope, and Sophia Duckworth. Central Park: A History and a Guide. New York: Clarkson N. Potter, 1967. Reed, Henry Hope, Robert M. McGee, and Esther Mipaas. Bridges of Central Park. New York: Greensward Foundation, 1990. Roper, Laura Wood. FLO: A Biography of Frederick Law Olmsted. Baltimore: John Hopkins University Press, 1973. Rosenzweig, Roy, and Elizabeth Blackmar. The Park and the People: A History of Central Park. Ithaca: Cornell University Press, 1992. Schuyler, David. The New Urban Landscape: The Redefinition of City Form in Nineteenth-Century America. New Studies in American Intellectual and Cultural History. Baltimore: Johns Hopkins University Press, 1986. Stevenson, Elizabeth. 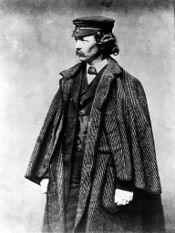 Park Maker: A Life of Frederick Law Olmsted. New York: Macmillan, 1977. Vaux, Calvert. Villas and Cottages. New York: Harper, 1864. Central Park in the snow, 1906. Courtesy of the Library of Congress. Original cropped. Detail of John Bachmann's bird's-eye view of Central Park, 1863. In 1863, Central Park was surrounded by farms. Frederick Law Olmsted, 1857. Courtesy of Wikipedia. 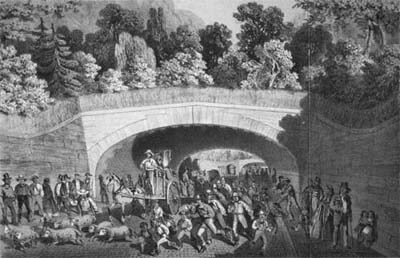 A tunnel road being used by sheep and a fire company, 1859. Source: Board of Commissioners of the Central Park, Third Annual Report, 1859. 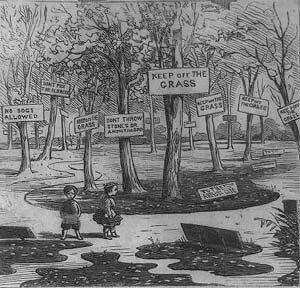 An 1869 cartoon about Central Park. The children in the cartoon are surrounded by signs that warn them to keep off the grass. The caption reads, "The Central Park. A delightful resort for toll-worn New Yorkers." Source: Frank Leslie's illustrated newspaper, 19 June 1869, page 221. Courtesy of the Library of Congress. Original lightened and cropped. Central Park today, surrounded by skyscrapers. Courtesy of Wikipedia. This text, or a variation on it, was originally published at duskpeterson.com. Copyright © 1994 Heather Elizabeth Peterson. Some rights reserved. The text is licensed under a Creative Commons Attribution Noncommercial License (creativecommons.org/licenses/by-nc/3.0). You may freely print, post, e-mail, share, or otherwise distribute the text for noncommercial purposes, provided that you include this paragraph. The author's policies on derivative works and fan works are available online (duskpeterson.com/copyright.htm).